A few days ago I was setting up a new resource build pipeline for our games, and wanted to integrate the build directly in Visual Studio. The goal was to include a resource manifest file in the project, and have them be fed to my compiler as part of the normal VC project build. Often the starting point for this is a simple command line entered as a Custom Build Event, but those are basically just dumb commands that don’t follow the project files at all. The next step up from there is configuring a Custom Build Tool on the files in question. This works well once you have it set up, but there are distinct drawbacks. Each file is configured completely separately, and there’s no way to share configuration. Adding the file to the project doesn’t do anything unless you go in and set several properties for the build tool. There has to be a better way. Setting all of these fields up gets old real quick. After asking around for that better way, I was pointed to Nathan Reed’s excellent write-up on Custom Targets and toolchains in VS. By setting up this functionality, you can configure a project to automatically recognize certain file extensions, and execute a predefined build task command line on all of them with correct incremental builds. This build customization system works great, and is absolutely worth setting up if that’s all you need! I followed those instructions and had my resource manifests all compiling nicely into the project – until I wanted to add an extra command line flag to just one file. It turns out that while the build customization targets are capable of a lot, the approach Nathan takes only takes you so far and effectively forces you to run the same command line for all of your custom build files. The file is now recognized as a “Resource Pack” and will build appropriately! But we have no options about how to build it and no ability to tweak the command line sent. With some help from Nathan and a lot of futzing around with modifications of the custom build targets included with VS, I’ve managed to do one better and integrate my resource builds fully into VS, with property pages and configurable command line. What follows is mostly just a stripped down copy of the masm (Microsoft Macro Assembler) build target, but should offer a good basis to work from. Now we have property pages for our custom target, along with custom properties for the command line switches. Command line display, including a box to insert additional options. For this type of custom build target, there are three files you will need: .props, .xml, and .targets. We’ll look at them in that order. Generally all three files should have the same name but the appropriate extension. Each one has a slightly different purpose and expands on the previous file’s contents. I’m not going to dwell too much on the particulars of MSBuild’s elements and format, but focus on providing listings and overviews of what’s going on. The props file provides the basic properties that define our custom build task. My task is called “ResourcePackTask” and you’ll see that name recurring throughout the code. What I’m doing here is to define the properties that make up my ResourcePackTask, and give them default values. The properties can be anything you like; in my case they’re just names representing the command line switches I want to provide as options. These are not necessarily GUI-visible options, as that will be configured later. Just think of it as a structure with a bunch of string values inside it, that we can reference later as needed. The key component in this file is the CommandLineTemplate, which makes up its own syntax for options that doesn’t seem to appear anywhere else. [AllOptions] will inject the switches configured in the GUI, and [AdditionalOptions] will add the text from the Command Line window. It’s otherwise normal MSBuild syntax and macros. Description="Specifies if the build should compute MurMur3 hashes of every resource file. (--compute-hashes)"
Description="Specifies if JSON diagnostic manifest output should be suppressed/disabled. (--no-json)"
Description="Specifies if a build log file should be generated. (--build-log)"
DisplayName="Prompt to send report immediately (/errorReport:prompt)"
DisplayName="Prompt to send report at the next logon (/errorReport:queue)"
DisplayName="Do not send report (/errorReport:none)"
All of these include a handy Switch parameter, which will eventually get pasted into our command line. At this point the IDE now knows what files we want to categorize, how to categorize them, and what UI to attach to them. The last and most complex piece of the puzzle is to tell it what to do with the files, and that’s where the .targets file comes in. I’m going to post this file in a few pieces and go over what each piece does. First, we declare that we want to attach property pages to this target, point the IDE to the xml file from before, and tell it what the name of the items is that we want property pages for. We also give it a Target name (_ResourcePackTask) for those items, which will be referenced again later. This is the weird part. In Nathan’s write-up, he uses a CustomBuild element to run the outside tool, but CustomBuild doesn’t have a way of getting the command line switches we set up. Instead we’re going to ask the MSBuild engine to read the provided assembly and ask its XamlTaskFactory to generate our ResourcePackTask. That XamlTaskFactory compiles a new C# Task object on the fly by reflecting our definitions from the .xml file (and maybe the .props file). This seems like an insane way to design a build system to me, but what do I know? In any case that seems to be how all of the MS tasks are implemented out of the box, and we’ll follow their lead verbatim. Let’s move on. MSBuild operates by executing targets based on a dependency tree. This next section configures a Target that will construct a pair of .tlog files which record the dependencies and outputs, and enable the VS incremental build tracker to function. Most of this seems to be boring boilerplate. The key piece is where [MSBuild]::NormalizePath appears. This little function call assembles the provided directory path and filename into a final path that will be recorded as the corresponding build output file for the input. I have a hard coded Resources path in here for now, which you’ll need to replace with something meaningful. The build system will look for this exact filename when deciding whether or not a given input needs to be recompiled, and you can inspect what you’re getting in the resulting tlog file. If incremental builds aren’t working correctly, check that file and check what MSBuild is looking for in the Diagnostic level logs. I should note at this point that the tlog target is optional, and that as written it only understands the direct source file and its direct output. In my case, it will see changes to the resource manifest file, and it will see if the output is missing. But it has no information about other files read by that compile process, so if I update a resource referenced by my manifest it won’t trigger a recompile. Depending on what you’re doing, it may be better to omit the tlog functionality and do your own incremental processing. Another possibility is writing a process that generates the proper tlog. Condition="'@(ResourcePackTask)' != '' and '%(ResourcePackTask.ExcludedFromBuild)' != 'true'"
This is the last piece of the file, defining one more Target. This is the target that actually does the heavy lifting, and you’ll see the recurrence of the _ResourcePackTask name from earlier. There are two properties BeforeTargets and AfterTargets (not used here) that set when in the build process this target should run. It also takes a dependency on the tlog target above, so that’s how that target is pulled in. Again there is some boilerplate here, but we start the actual build by simply outputting a message that reports what file we’re compiling. Lastly, the ResourcePackTask entry here constructs the execution of the task itself. I think that %(ResourcePackTask.Whatever) here has the effect of copying the definitions from the .props file into the task itself; the interaction between these three files doesn’t seem especially well documented. In any case what seems to work is simply repeating all of your properties from the .props into the ResourcePackTask and they magically appear in the build. Here’s a complete code listing for the file. With all of that in place, hypothetically Visual Studio will treat your fancy new file type and its attendant compile chain exactly how you want. There are probably still many improvements to be made – in particular, this scheme as written seems to suppress stdout from the console at the default “Minimal” MSBuild verbosity, which is something I haven’t dug into. But this is a solid start for a fully integrated build process. 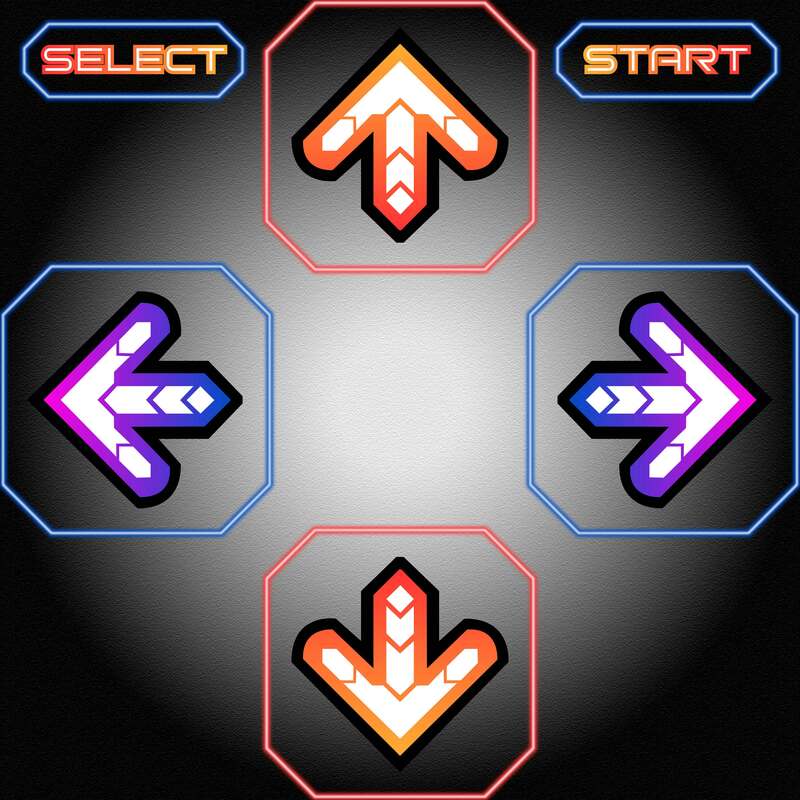 If you’re unfamiliar with my DanceForce work or the previous versions, please read the introduction of my V3 build post for the rationale and advantages of this particular approach to a hard pad and what I’m going for. 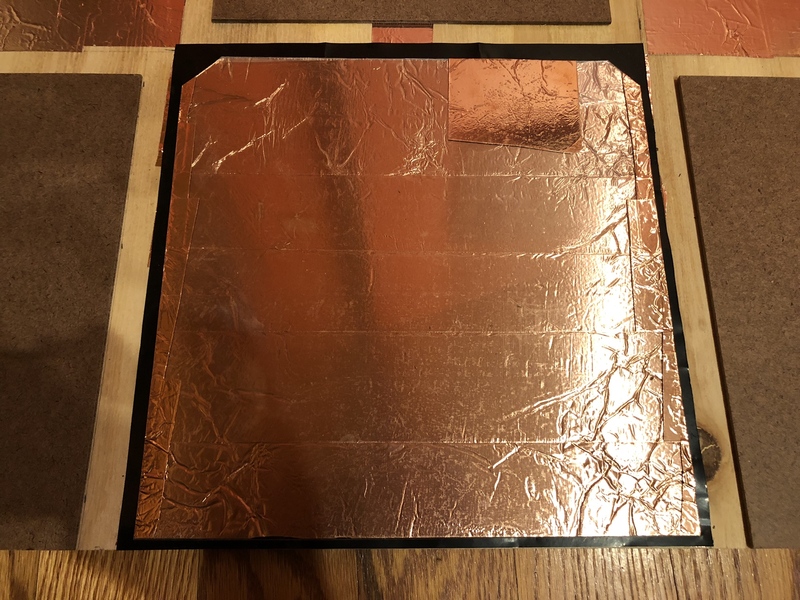 In short, the DF is a slimmer, lighter hardpad that can be more reliable and consistent than conventional designs due to its use of pressure sensitive sensors that are separated from the “click action” of the actual steps. I’m now building the DanceForce V4 prototype. V4 is simpler, easier to build, requires less parts, and is cheaper. Traditionally I build and design these pads, make a bunch of tweaks, and play on them for a good while. Then I begin working on the draft of the instructional write-up, and eventually publish the full how-to guide. If I followed that timeline again, this V4 guide would appear in *checks notes* summer 2020. Let’s not do that. I began work this past weekend, so I’m just going to post a stream of photos and exactly what I’m doing as I go. Excluding pad graphics and a few incidentals, this pad costs about $160 to put together. Current Status: Core pad is done but top hasn’t been installed and control board hasn’t been assembled. These are not changed from V3. 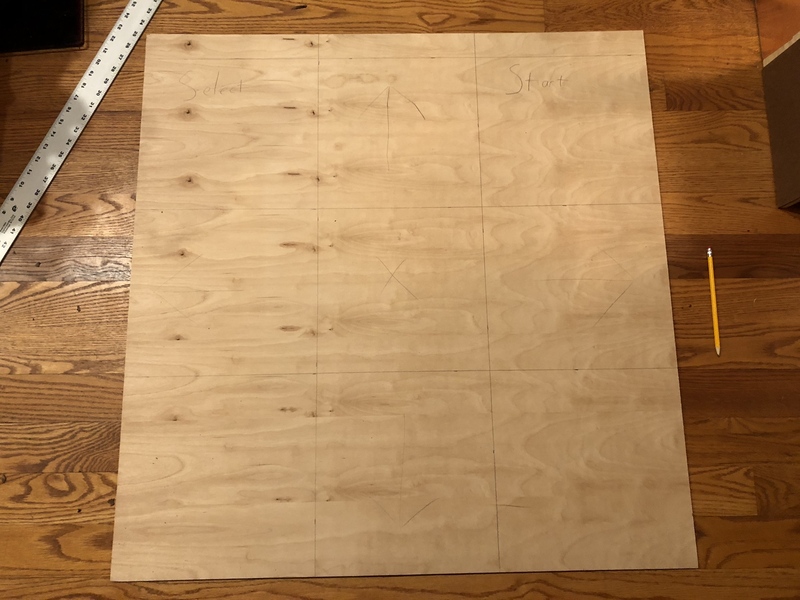 Basic layout sketch of the initial cut pad. Note: the dimensions in this photo are slightly wrong and I had to go back and fix it. Always triple check your measurements before cutting and gluing! 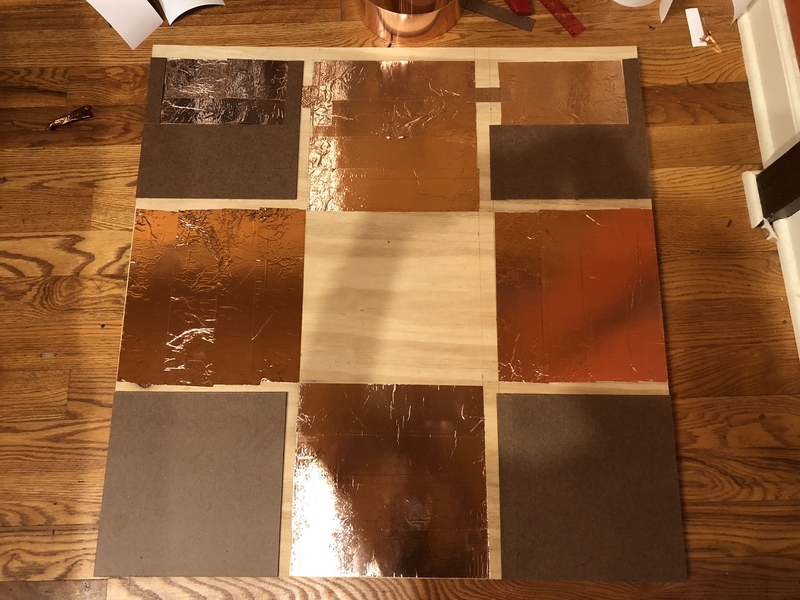 The base layer is 1/2″ plywood cut to 34″ x 33″. The extra inch on top will be useful for wiring. I’ve marked off the steps in pencil, and then begun adding the spacer layer. I’m using 1/8″ hardboard this time around, for shallower steps than in the past. 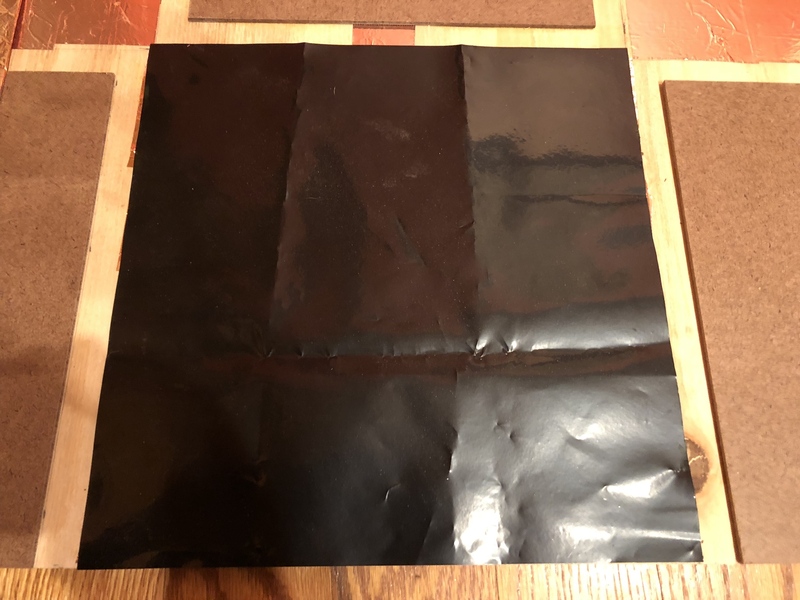 The bottom panels are 10.25″ square, the top are 10.25″ x 5.25″. The upper panels are sized to leave space for Start/Select buttons. Next step is beginning to lay out the contacts. 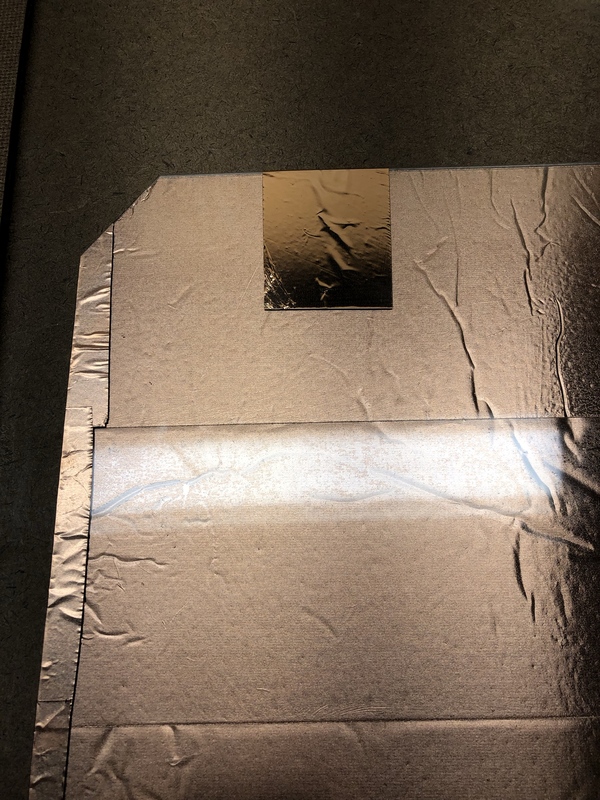 I’m using 3″ copper tape today, but 4″ is probably even better because it’s less work and barely costs any more. NOTE: Hardboard is completely flush, no click action at all. 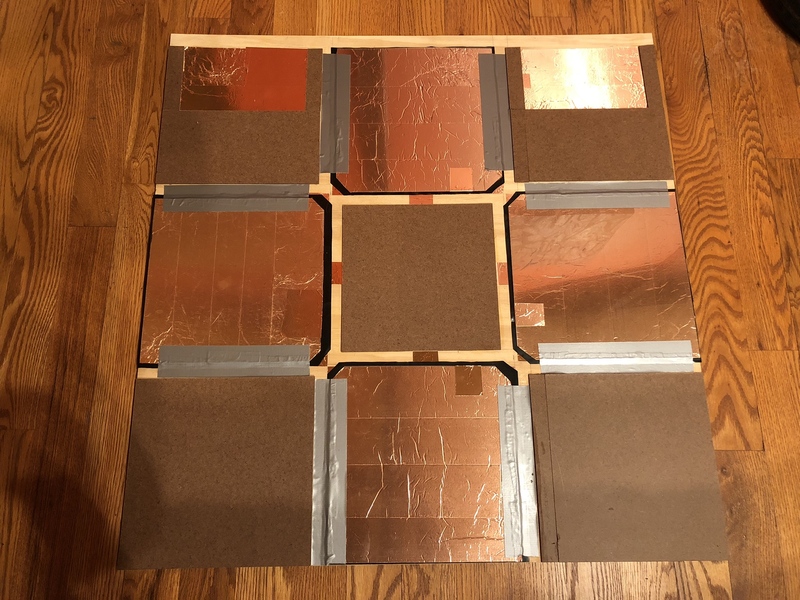 Use 1/4″ MDF for the spacer panels instead, and construction paper over the sensors to fine tune if needed. Finally, all of the contacts get connected together with a plus to serve as the common contact for the step sensors. That concludes the base layer. Start by building the top contact. 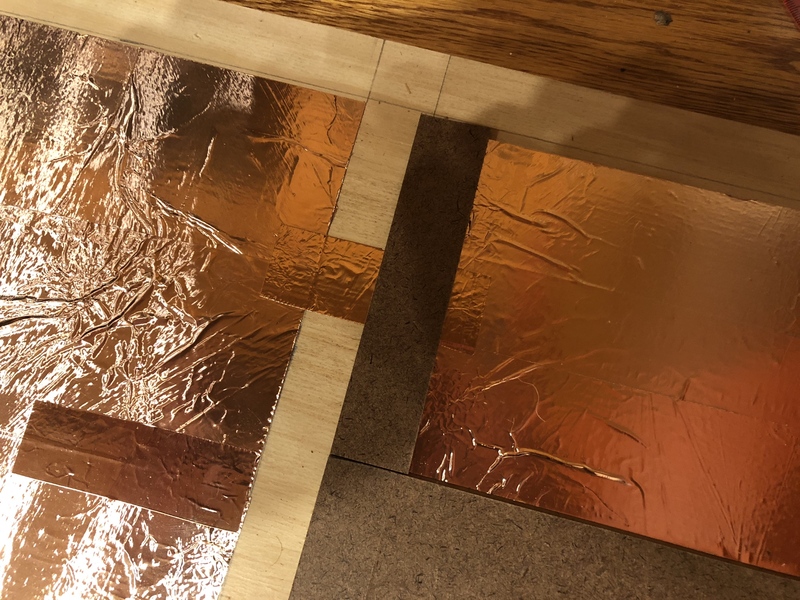 Cut four 10.5″ squares of Lexan, and cover one side in copper tape. Add a little strip around to the top side to serve as our connection point for later. It’s important here to place the contact strip off center. You don’t want it touching the extension strip on the common contact. I also clip the corners to leave space between steps. Place an 11″ square of Velostat over the bottom of the contact. It does not need to cover it completely. Then the top contact goes over it. The top contact MUST be insulated by Velostat on every edge or the step will not work. That’s why we cut it a little small. 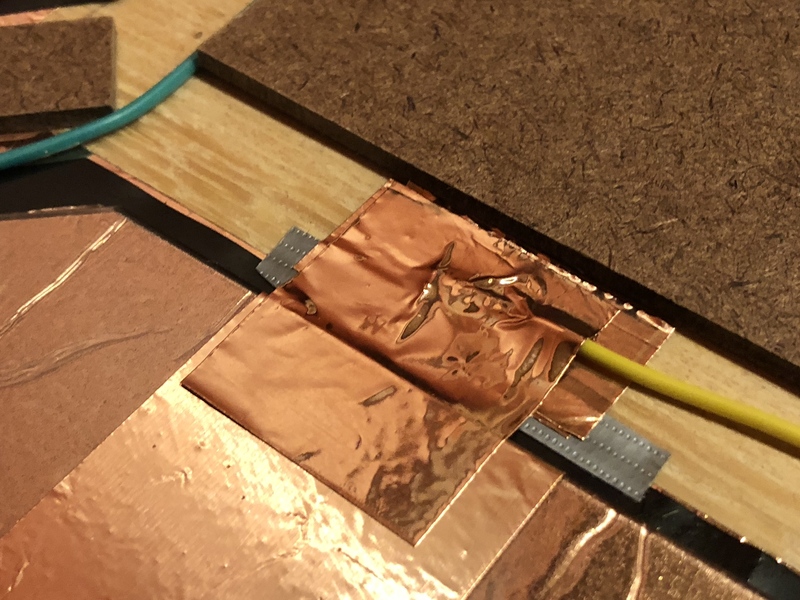 I’ve moved to 6 mil Velostat in the V4 design due to the higher sensitivity of pure copper contacts. Finally, duct tape secures the sensor in place. 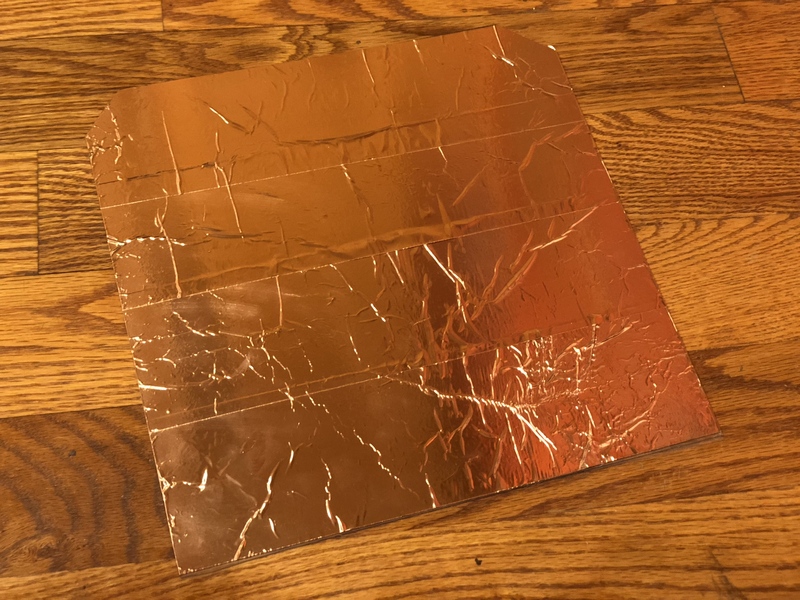 I’ve done a couple experiments now and it appears that too much duct tape is a bad idea. 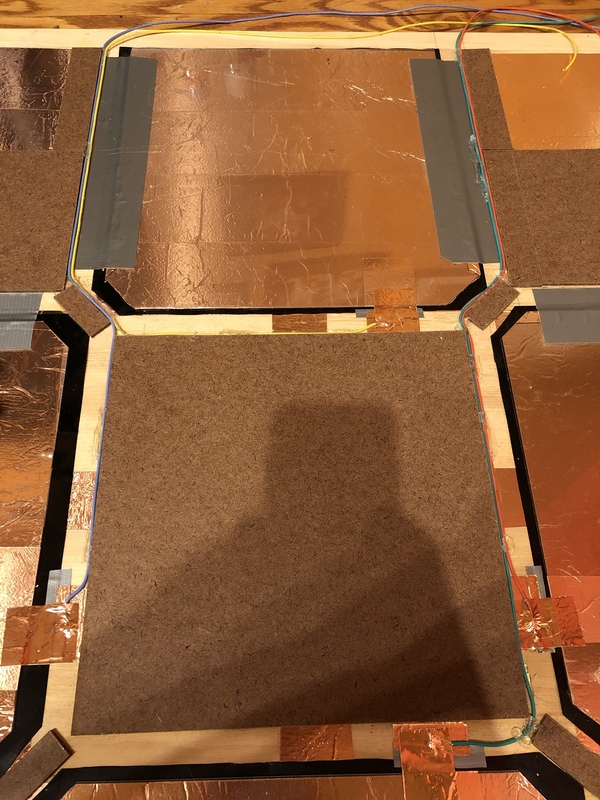 This is a pressure sensor and excessive tape applies so much pressure that there isn’t enough range left to reliably detect steps. 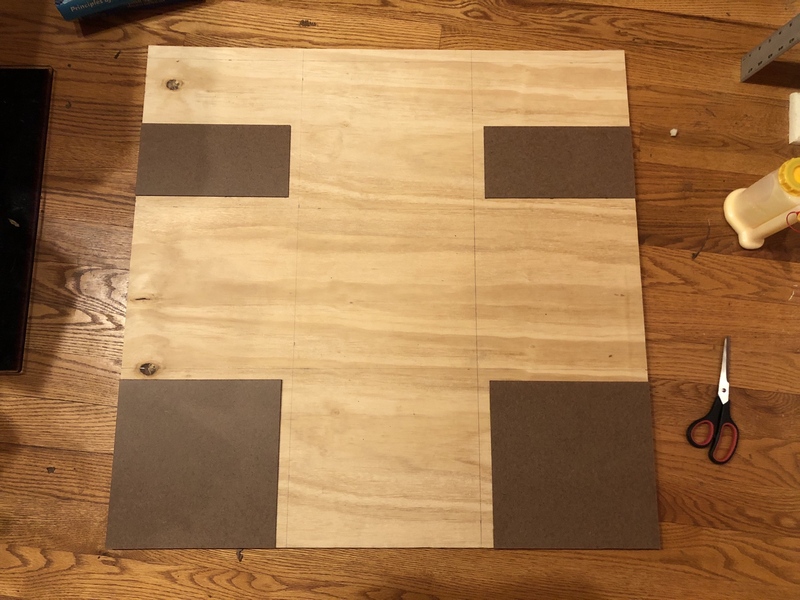 The clipped corners leave space for hardboard strips that will fill the space between diagonal steps. Four assembled sensors. It’s a good idea to test them with a multimeter at this point, while the duct tape still isn’t that strongly bonded. You’re looking for 70+ ohms at rest, and sub-10 with foot pressure. I also add some corner boundaries at this stage. 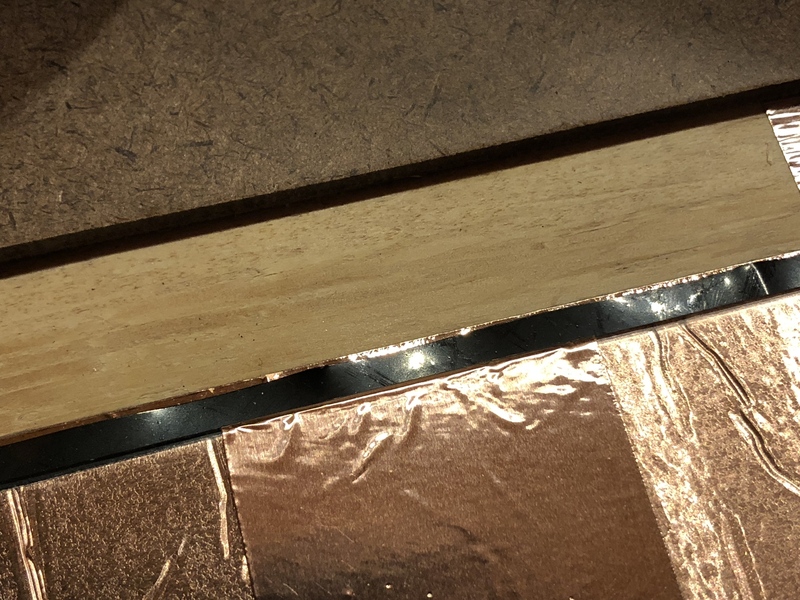 These are hardboard strips of 1.75″ x 0.5″ and they are important to have good corner separation of the steps. The gap is important, wiring is going to run through there. 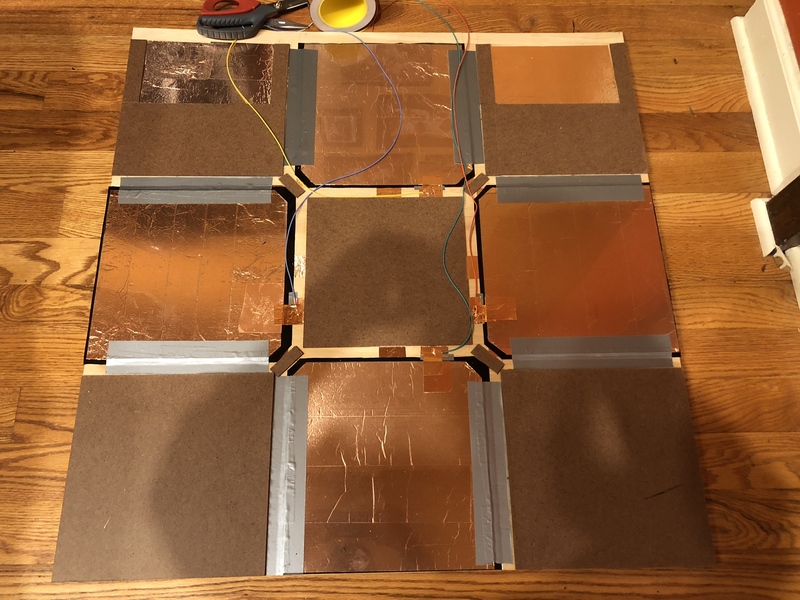 Get ready to break out the soldering iron – but we have some prep work to do first. 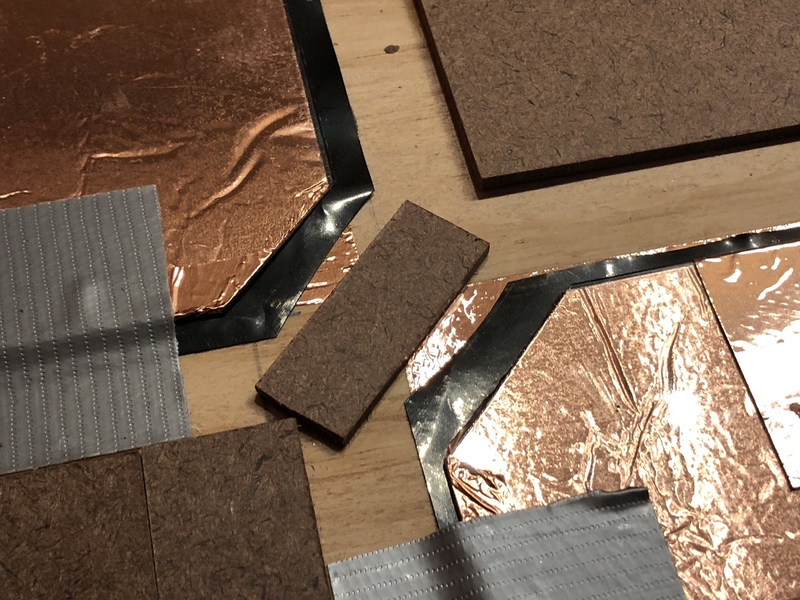 Take a look at the edges where your top contacts are – is copper peeking out past the Velostat? We don’t want this. It will short if we try to take the contact over this section. 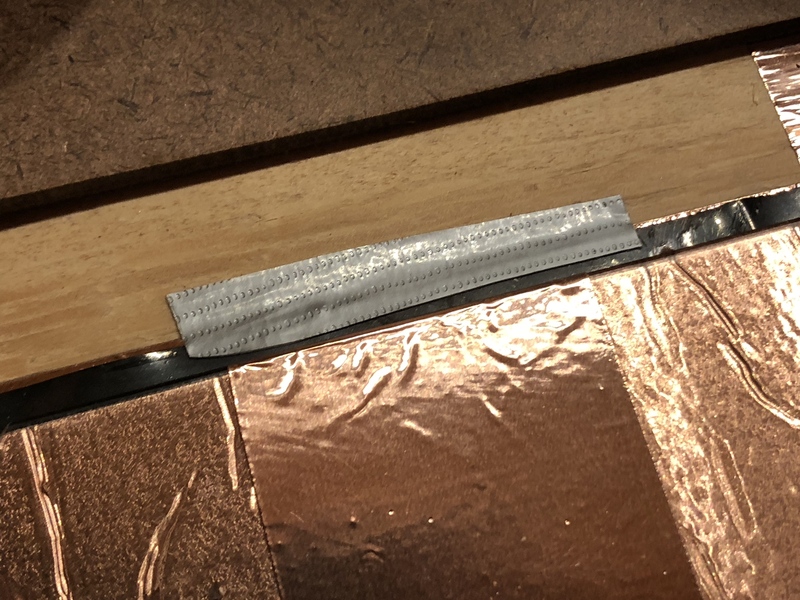 A little strip of electrical or duct tape will insulate the boundary. That’s better. 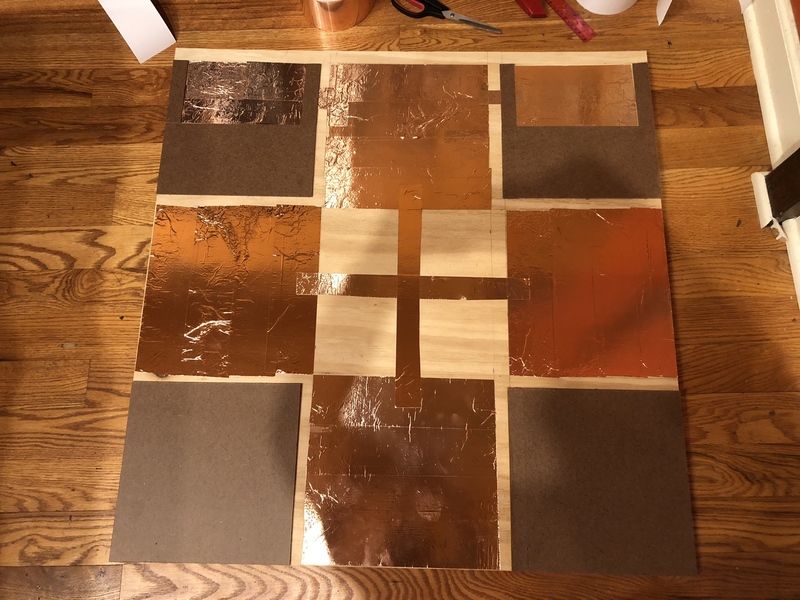 Now I’m going to build a solder pad from two layers of copper tape. This solder pad I’ve laid down does not connect to the top contact of the step yet. This way if the step needs to come out, the soldered wire can stay where it is. Now to solder some wires. It’s important to leave lots of extra length when cutting the wire, I’ve been screwed multiple times by not having enough spare lead. Be judicious with the heat. 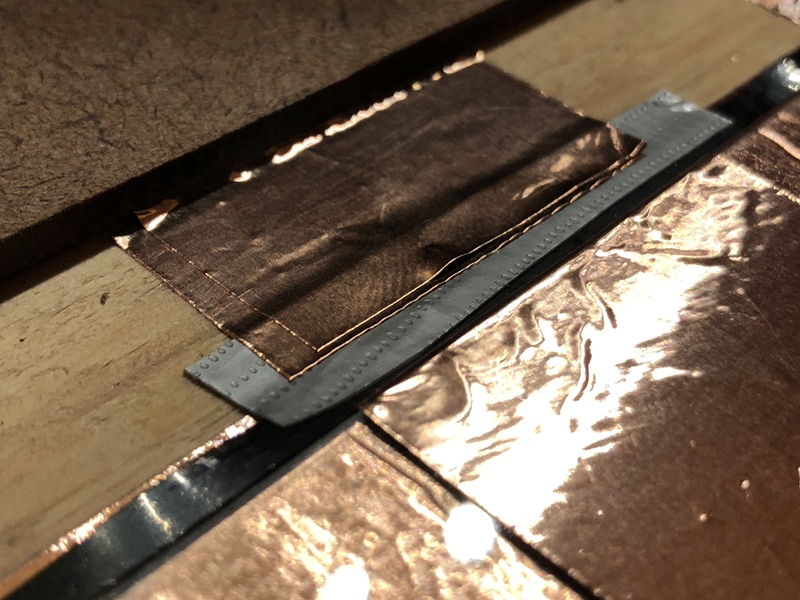 The copper tape solders decently enough but it’s not going to tolerate the iron for an extended period. 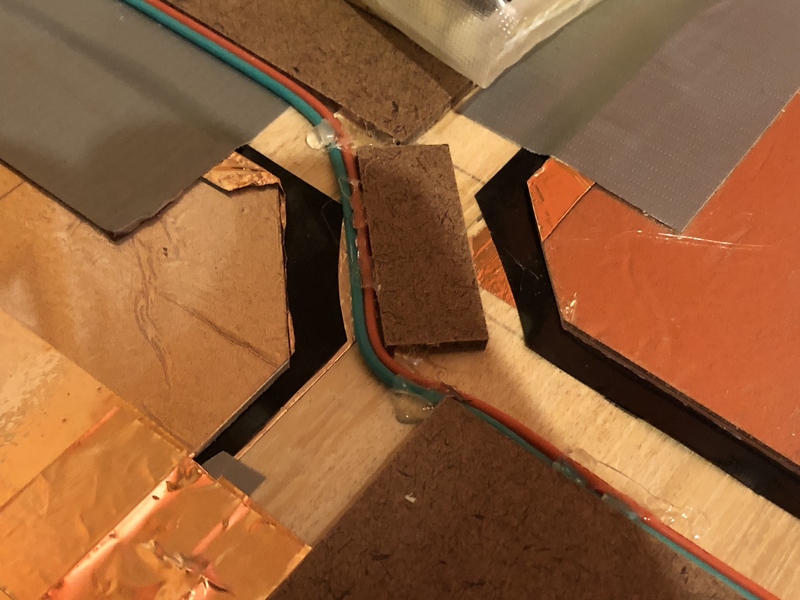 Finally, one more layer of copper tape will link the top contact to the solder pad and shield it all in one go. I’ll finish up Start and Select later. For now, we really need to neaten up those wires. 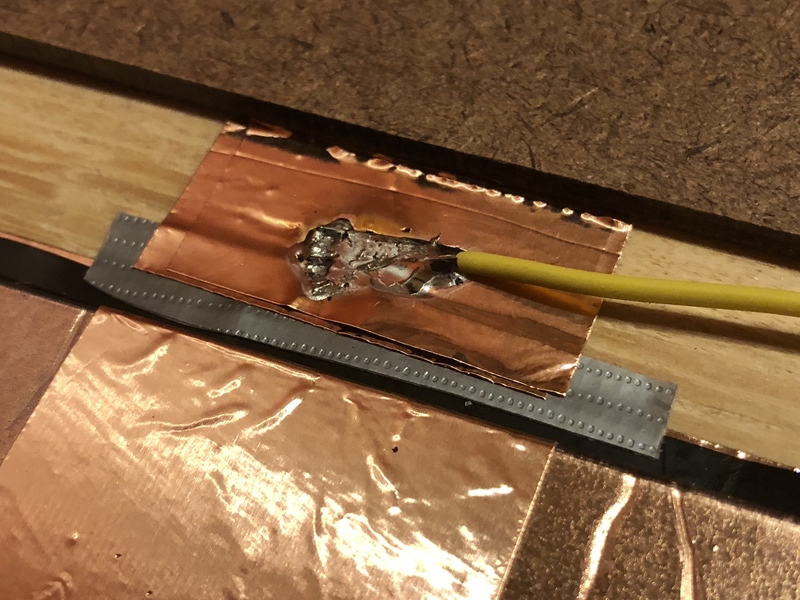 Find a hot glue gun, route the wires nicely up through the top of the pad, and glue them in place. And with that, the internal construction of the pad is complete. This is Part 1 of a series examining techniques used in game graphics and how those techniques fail to deliver a visually appealing end result. See Part 0 for a more thorough explanation of the idea behind it. Let’s review, very quickly. In the real world, the total contrast ratio between the brightest highlights and darkest shadows during a sunny day is on the order of 1,000,000:1. We would need 20 bits of just luminance to represent those illumination ranges, before even including color in the mix. A typical DSLR can record 12-14 bits (16,000:1 in ideal conditions). A typical screen can show 8 (curved to 600:1 or so). Your eyes… well, it’s complicated. Wikipedia claims 6.5 (100:1) static. Others disagree. Graphics programmers came up with HDR and tone mapping to solve the problem. Both film and digital cameras have this same issue, after all. They have to take enormous contrast ratios at the input, and generate sensible images at the output. So we use HDR to store the giant range for lighting computations, and tone maps to collapse the range to screen. The tone map acts as our virtual “film”, and our virtual camera is loaded with virtual film to make our virtual image. Oh, and we also throw in some eye-related effects that make no sense in cameras and don’t appear in film for good measure. Of course we do. And now, let’s marvel in the ways it goes spectacularly wrong. In order: Battlefield 1, Uncharted: Lost Legacy, Call of Duty: Infinite Warfare, and Horizon Zero Dawn. HZD is a particular offender in the “terrible tone map” category and it’s one I could point to all day long. And so we run head first into the problem that plagues games today and will drive this series throughout: at first glance, these are all very pretty 2017 games and there is nothing obviously wrong with the screenshots. But all of them feel videogamey and none of them would pass for a film or a photograph. Or even a reasonably good offline render. Or a painting. They are instantly recognizable as video games, because only video games try to pass off these trashy contrast curves as aesthetically pleasing. These images look like a kid was playing around in Photoshop and maxed the Contrast slider. Or maybe that kid was just dragging the Curves control around at random. The funny thing is, this actually has happened to movies before. Hahaha. Look at that Smaug. He looks terrible. Not terrifying. This could be an in-game screenshot any day. Is it easy to pick on Peter Jackson’s The Hobbit? Yes, it absolutely is. But I think it serves to highlight that while technical limitations are something we absolutely struggle with in games, there is a fundamental artistic component here that is actually not that easy to get right even for film industry professionals with nearly unlimited budgets. Allow me an aside here into the world of film production. In 2006, the founder of Oakley sunglasses decided the movie world was disingenuous in their claims of what digital cameras could and could not do, and set out to produce a new class of cinema camera with higher resolution, higher dynamic range, higher everything than the industry had and would exceed the technical capabilities of film in every regard. The RED One 4K was born, largely accomplishing its stated goals and being adopted almost immediately by one Peter Jackson. Meanwhile, a cine supply company founded in 1917 called Arri decided they don’t give a damn about resolution, and shipped the 2K Arri Alexa camera in 2010. How did it go? 2015 Oscars: Four of the five nominees in the cinematography category were photographed using the ARRI Alexa. Happy belated 100th birthday, Arri. So what gives? Well, in the days of film there was a lot of energy expended on developing the look of a particular film stock. It’s not just chemistry; color science and artistic qualities played heavily into designing film stocks, and good directors/cinematographers would (and still do) choose particular films to get the right feel for their productions. RED focused on exceeding the technical capabilities of film, leaving the actual color rendering largely in the hands of the studio. But Arri? Arri focused on achieving the distinctive feel and visual appeal of high quality films. They better understood that even in the big budget world of motion pictures, color rendering and luminance curves are extraordinarily difficult to nail. They perfected that piece of the puzzle and it paid off for them. Let’s bring it back to games. The reality is, the tone maps we use in games are janky, partly due to technical limitations. We’re limited to a 1D luminance response where real film produces both hue and saturation shifts. The RGB color space is a bad choice to be doing this in the first place. And because nobody in the game industry has an understanding of film chemistry, we’ve all largely settled on blindly using the same function that somebody somewhere came up with. It was Reinhard in years past, then it was Hable, now it’s ACES RRT. And it’s stop #1 on the train of Why does every game this year look exactly the goddamn same? The craziest part is we’re now at the point of real HDR televisions showing game renders with wider input ranges. Take this NVIDIA article which sees the real problem and walks right past it. The ACES tone map is destructive to chroma. Then they post a Nikon DSLR photo of a TV in HDR mode as a proxy for how much true HDR improves the viewing experience. Which is absolutely true – but then why does the LDR photo of your TV look so much better than the LDR tone map image? There’s another tone map in this chain which nobody thought to examine: Nikon’s. They have decades of expertise in doing this. Lo and behold, their curve makes a mockery of the ACES curve used in the reference render. Wanna know why that is? It’s because the ACES RRT was never designed to be an output curve in the first place. Its primary design goal is to massage differences between cameras and lenses used in set so they match better. You’re not supposed to send it to screen! It’s a preview/baseline curve which is supposed to receive a film LUT and color grading over top of it. “Oh, but real games do use a post process LUT color grade!” Yeah, and we screwed that up too. 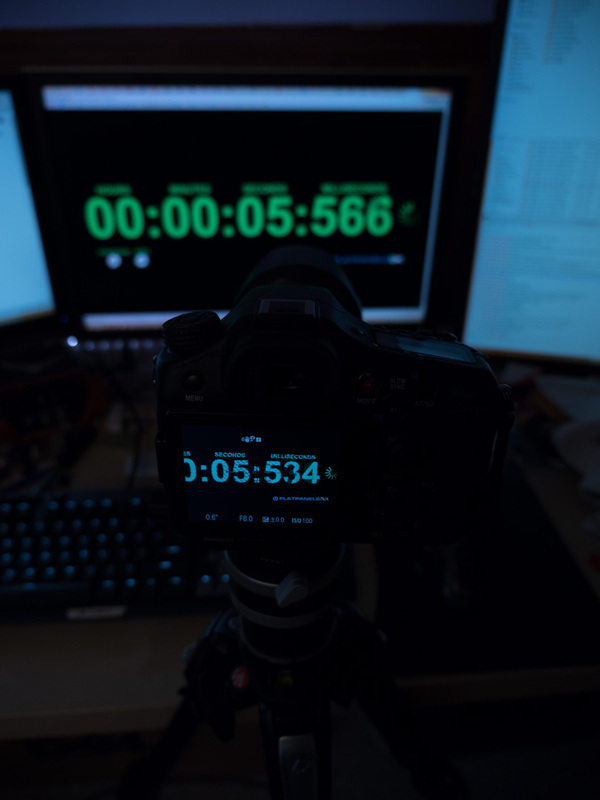 We don’t have the technical capability to run real film industry LUTs in the correct color spaces, we don’t have good tools to tune ours, they’re stuck doing double duty for both “filmic look” as well as color grading, the person doing it doesn’t have the training background, and it’s extraordinary what an actual trained human can do after the fact to fix these garbage colors. Is he cheating by doing per-shot color tuning that a dynamic scene can’t possibly accomplish? Yes, obviously. But are you really going to tell me that any of these scenes from any of these games look like they are well balanced in color, contrast, and overall feel? Of course while we’re all running left, Nintendo has always had a fascinating habit of running right. I can show any number of their games for this, but Zelda: Breath of the Wild probably exemplifies it best when it comes to HDR. No HDR. No tone map. The bloom and volumetrics are being done entirely in LDR space. (Or possibly in 10 bit. Not sure.) Because in Nintendo’s eyes, if you can’t control the final outputs of the tone mapped render in the first place, why bother? There’s none of that awful heavy handed contrast. No crushed blacks. No randomly saturated whites in the sunset, and saturation overall stays where it belongs across the luminance range. The game doesn’t do that dynamic exposure adjustment effect that nobody actually likes. Does stylized rendering help? Sure. But you know what? Somebody would paint this. It’s artistic. It’s aesthetically pleasing. It’s balanced in its transition from light to dark tones, and the over-brightness is used tastefully without annihilating half the sky in the process. Now I don’t think that everybody should walk away from HDR entirely. (Probably.) There’s too much other stuff we’ve committed to which requires it. But for god’s sake, we need to fix our tone maps. We need to find curves that are not so aggressively desaturating. We need curves that transition contrast better from crushed blacks to mid-tones to blown highlights. LUTs are garbage in, garbage out and they cannot be used to fix bad tone maps. We also need to switch to industry standard tools for authoring and using LUTs, so that artists have better control over what’s going on and can verify those LUTs outside of the rendering engine. In the meantime, the industry’s heavy hitters are just going to keep releasing this kind of over-contrasty garbage. Before I finish up, I do want to take a moment to highlight some games that I think actually handle HDR very well. First up is Resident Evil 7, which benefits from a heavily stylized look that over-emphasizes contrast by design. That’s far too much contrast for any normal image, but because we’re dealing with a horror game it’s effective in giving the whole thing an unsettling feel that fits the setting wonderfully. The player should be uncomfortable with how the light and shadows collide. This particular scene places the jarring transition right in your face, and it’s powerful. Next, at risk of seeming hypocritical I’m going to say Deus Ex: Mankind Divided (as well as its predecessor). The big caveat with DX is that some scenes work really well. The daytime outdoors scenes do not. The night time or indoor scenes that fully embrace the surrealistic feeling of the world, though, are just fantastic. Somehow the weird mix of harsh blacks and glowing highlights serves to reinforce the differences between the bright and dark spots that the game is playing with thematically throughout. It’s not a coincidence that Blade Runner 2049 has many similarities. Still too much contrast though. Lastly, I’m going to give props to Forza Horizon 3. Let’s be honest: cars are “easy mode” for HDR. They love it. But there is a specific reason this image works so well. It is low contrast. Nearly all of it lives in the mid-tones, with only a few places wandering into deep shadow (notably the trees) and almost nothing in the bright highlights. But the image is low contrast because cars themselves tend to use a lot of black accents and dark regions which are simply not visible when you crush the blacks as we’ve seen in other games. Thus the toe section of the curve is lifted much more than we normally see. Similarly, overblown highlights mean whiting out the car in the specular reflections, which are big and pretty much always image based lighting for cars. It does no good to lose all of that detail, but the entire scene benefits from the requisite decrease in contrast. The exposure level is also noticeably lower, which actually leaves room for better mid-tone saturation. (This is also a trick used by Canon cameras, whose images you see every single day.) The whole image ends up with a much softer and more pleasant look that doesn’t carry the inherent stress we find in the images I criticized at the top. If we’re looking for an exemplar for how to HDR correctly in a non-stylized context, this is the model to go by. Where does all this leave us? With a bunch of terrible looking games, mostly. There are a few technical changes we need to make right up front, from basic decreases in contrast to simple tweaks to the tone map to improved tools for LUT authoring. But as the Zelda and Forza screenshots demonstrate, and as the Hobbit screenshot warns us, this is not just a technical problem. Bad aesthetic choices are being made in the output stages of the engine that are then forced on the rest of the creative process. Engine devs are telling art directors that their choices in tone maps are one of three and two are legacy options. Is it bad art direction or bad graphics engineering? It’s both, and I suspect both departments are blaming the other for it. The tone map may be at the end of graphics pipeline, but in film production it’s the first choice you make. You can’t make a movie without loading film stock in the camera, and you only get to make that choice once (digital notwithstanding). Don’t treat your tone map as something to tweak around the edges when balancing the final output LUT. Don’t just take someone else’s conveniently packaged function. The tone map’s role exists at the beginning of the visual development process and it should be treated as part of the foundation for how the game will look and feel. Pay attention to the aesthetics and visual quality of the map upfront. In today’s games these qualities are an afterthought, and it shows. UPDATE: User “vinistois” on HackerNews shared a screenshot from GTA 5 and I looked up a few others. It’s very nicely done tone mapping. Good use of mid-tones and contrast throughout with great transitions into both extremes. You won’t quite mistake it for film, I don’t think, but it’s excellent for something that is barely even a current gen product. This is proof that we can do much better from an aesthetic perspective within current technical and stylistic constraints. Heck, this screenshot isn’t even from a PC – it’s the PS4 version.